Gaza demonstration in support of Ahed Tamimi. Photo: NurPhoto/SIPA USA/PA Images.In December 2017, a then 16-year-old Palestinian girl named Ahed Tamimi was filmed slapping and kicking an Israeli soldier outside her family home in the occupied West Bank. She had just heard that her 14-year-old cousin Muhammad had been shot in the head with a rubber bullet. Tamimi then faced up to 10 years in prison on charges of assault and throwing stones. Last week she accepted a plea deal of eight months in prison (including four months already served). She is reportedly expected to plead guilty to four assault, incitement and obstruction charges. 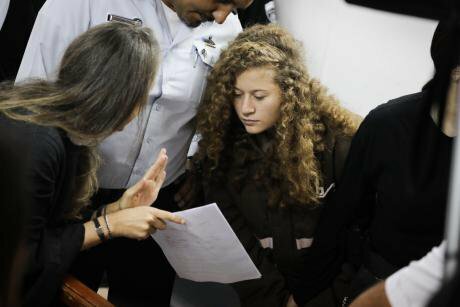 The video of the incident went viral and was widely reported; Tamimi has been compared to Rosa Parks and Joan of Arc, among other heroic figures. But while the confrontation has provoked much debate, little appears to have changed in the region, where Tamimi is yet another child detainee. The latest published statistics, from November 2017, show Israel was holding more than 300 Palestinian minors in prison. Though narrative victories can be as important as battlefield military gains in today’s conflicts, which are increasingly fought online and via social media as well. Tamimi’s story and her now iconic image has significant potential to influence opinions and positions on the ongoing occupation of Palestine. The potential influence of individual civilians, particularly girls and young women, in contemporary conflicts is a core theme in the recently-published book War in 140 Characters: How Social Media is Reshaping Conflict in the Twenty-First Century, by David Patrikarakos. It opens with a story that is strikingly similar to Tamimi’s case. Patrikarakos’s first chapter is about another 16-year-old Palestinian girl, Farah Baker. She also became a global icon of resistance through social media, during the 2014 ‘Operation Protective Edge’ conflict in which the Gaza strip came under heavy bombardment. On Twitter, Baker’s followers grew from around 800 to more than 150,000 as she filmed the chaos from her balcony. “She was a child, she was female, and a civilian. She was a civilian being bombed. She should have been the most powerless person, in a deeply patriarchal society,” Patrikarakos told me in a recent interview. But instead Baker drew global attention at a turning point in the Israel-Palestine conflict. "A lone teenage girl can now battle, and threaten, the institutional power of one of the world’s most powerful armies.”Patrikarakos calls this new kind of empowered, networked individual 'homo digitalis'. The shift between hierarchical to networked power in contemporary warfare didn’t start with Tamimi, or Baker, and such observations have been made before. Operation Protective Edge, however, was one of the first wars to be documented mainly by amateurs on social media platforms. Since then, citizen journalists have become the often sole source of news in the Syrian civil war, accompanied by raging, complex disputes over credibility, authenticity and bias. Amid these debates, and talk about ‘fake news,’ would Baker's story find the same audience today? Her appeal in 2014 leaned heavily on her presentation as a 'normal girl' caught up in a situation beyond her control. Her tweets often emphasised the innocence of children. “BOMBING CHILDREN IS NOT OKAY. That's when you know that HUMANITY DIED,” one read. As Patrikarakos points out, it's notable that Baker was named by Foreign Policy magazine as an influential 'chronicler', not an activist. Tamimi's identity, on the other hand, is overtly political. Her family is renowned for documenting confrontations and abuses in their village of Nabi Saleh as well as for organising and protesting publicly. Tamimi’s own history of activism has drawn global attention; she was invited to have breakfast with Turkey's Prime Minister, for example, after she was filmed in 2012 shoving and shouting at soldiers twice her size. Significantly, both Baker and Tamimi managed to reach beyond the demographic who regularly follow events related to the Israel-Palestine conflict. How did this happen? “This is an age that prizes authenticity above all else,” Patrikarakos told me. This might help explain why a child is more likely to be believed than an adult who understands the power of lies online, though his book also highlights a gendered dimension to this issue. Tamimi and Baker both managed to communicate a sense of raw, righteous anger to their followers and the general public. This can be seen as related to a child’s pure sense of right and wrong. But are we also more likely to identify and sympathise with girls, who “could be your sister,” or “your daughter”? 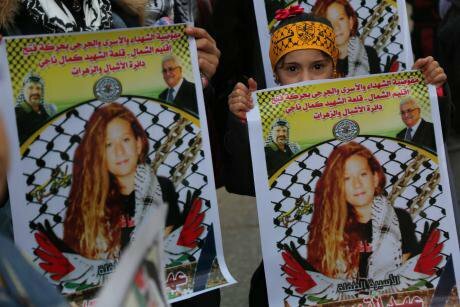 Tamimi’s appearance, with her long curly blonde hair (rare for Palestinians), has been particularly contentious. Some Israeli voices have alleged that the slapping incident was a manufactured performance for a global audience, to discredit Israel. She was dubbed “Shirley Temper,” and a formal investigation was even opened into the claim that her family were a troupe of actors. But the accusation that the incident was purposefully filmed to influence a global audience, and therefore must be duplicitous or 'fake', is in itself a bizarre leap of logic. Tamimi’s family appears to be more than aware that physical confrontation and global content distribution are two sides of the same war. Isn’t this what an act of resistance looks like in the media age? Patrikarakos argues that Israel will always be at a disadvantage when it comes to the information war. Social media is an inherently emotional medium, favouring the sensational along with the horrific. To put it crassly: the suffering of the innocent gets clicks, and Israel inflicts far more civilian casualties. Perhaps Tamimi’s gender does strengthen her power and influence in the global information war. But focusing on her role as a symbol, or a ‘tool,’ in this conflict can make it easy to lose sight of her humanity as a young person whose own life and future is at stake. Personal stories of children and women have always played a prominent role in wartime propaganda. What’s changed is that now girls like Tamimi and Baker appear to have a higher degree of agency over how their stories are told.